Had a great time. The cabin was very clean, loved the location and enjoyed all of the beautiful scenery. We came here to celebrate our 25th anniversary. Thank you for allowing us to enjoy your beautiful cabin for a few days. We really enjoyed it and don't want to leave. Thank you for letting us stay in the beautiful cabin! This trip has been on of our favorites so far. The kids were so excited then the Mountains. We can't wait to come back and enjoy the peace and quiet and the beauty. Thank you so much for the most beautiful stay at Wolf Ridge! The cabin was so beautiful as well as the view. Very relaxing! Wonderful weather while we were here. Can't wait to come back. Thank you! We enjoyed our stay here very much. The Deep Creek Trail was wonderful and the whole atmosphere of the wooded mountains renewed our spirits. Thank you. We will be back. Thank you for sharing you beautiful home. We had a wonderful time. The view was gorgeous. We visited for our honeymoon. This is a great cabin with very nice seclusion. We loved our relaxation time and one on one time. The cabin is beautiful and the view even better. This is our grandson's first trip to the Smoky's and he had a blast. We love the area and are never disappointed. We will be back soon. This was our second trip to the Smokies and it was better than the first. Perfect weather, relaxing days. We rode the train and went to the Nantahala Out Door Center. This cabin was great and incredibly clean. This is our families first trip to Bryson Cit and we ere are very happy with our stay. We booked this cabin last min and we are so glad that we did. As soon as we got here we immediately felt comfortable and almost as if we are in our own home. Our stay was great and hopefully we can come back soon. The staff were very kind and very helpful in booking our cabin rental and answering all our questions. The cabin and the view was spectacular! Wolf Ridge was exceptionally clean and very tranquil. We enjoyed our stay tremendously and look forward to making the trip again soon. We went sightseeing around the area and found it to be wonderfully awesome. The Great Smokey Train ride was enjoyable and the whitewater rafting was an awesome experience! This is our 2nd trip to the Great Smoky Mountains. This cabin was great very secluded. The cabin was lovely and we really enjoyed our stay. We also rode the train in Bryson City. This is our first time in this area and we loved it!. The cabin is beautiful and exceptionally clean, very, peaceful and relaxing. We went sightseeing, rode the train, and went white water rafting. We are looking forward to returning for more great memories. What a beautiful, peaceful and scenic environment. We had a very relaxing time, hiking, wondering in town and enjoying ice cream. This is a beautiful cabin it was very well maintained and clean. What a lovely peaceful retreat. The weather has been wonderful here sightseeing and relaxing. Can't wait to come back. Had a wonderful time! The cabin was very comfortable and relaxing. Very helpful, able to answer ever questions thoroughly. Most amazing vacation. Great couple getaway. Relaxing and fun, it was wonderful. Cheapest, prettiest, best location. Altogether amazing. Thank you so much letting us stay in your beautiful Wolf Ridge Cabin! It was truly a dream come true. We are already saying that we hope our future home looks just like this cabin. 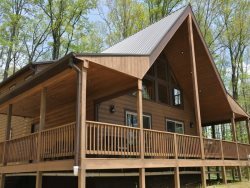 The cabin was wonderfully kept, the view is amazing everything we needed was provided and it was an awesome experience. We absolutely be back.